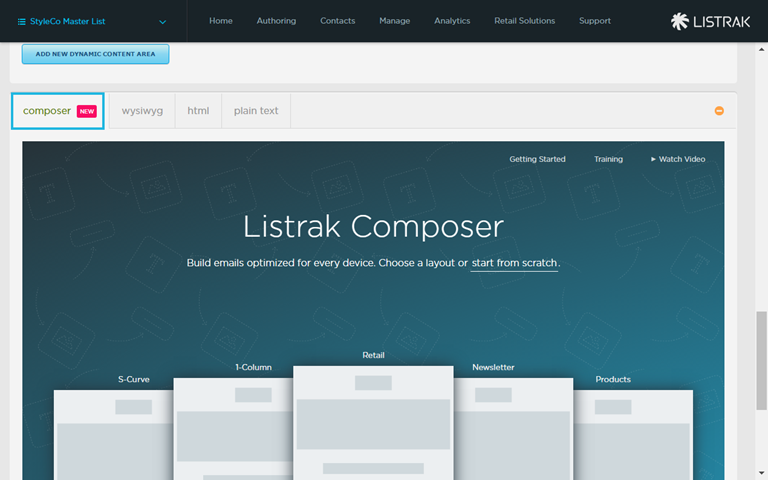 Learn more about how to use dynamic content in Listrak Composer. Before building out the dynamic content portion of your email, build out the static portions of the email, such as your header and footer. 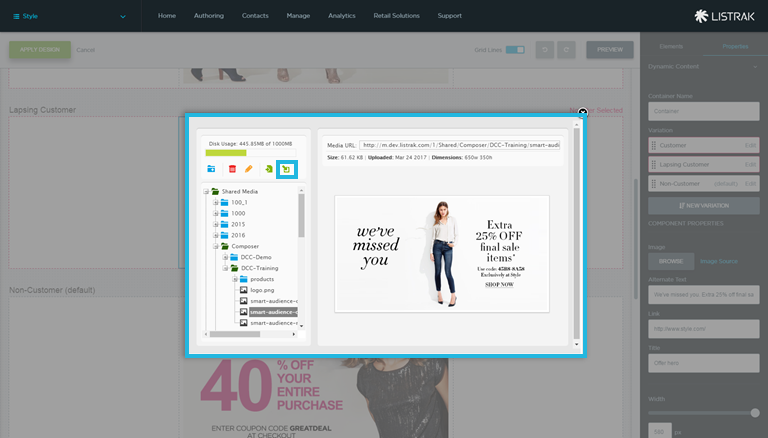 Click here to learn more about building your email in Composer. 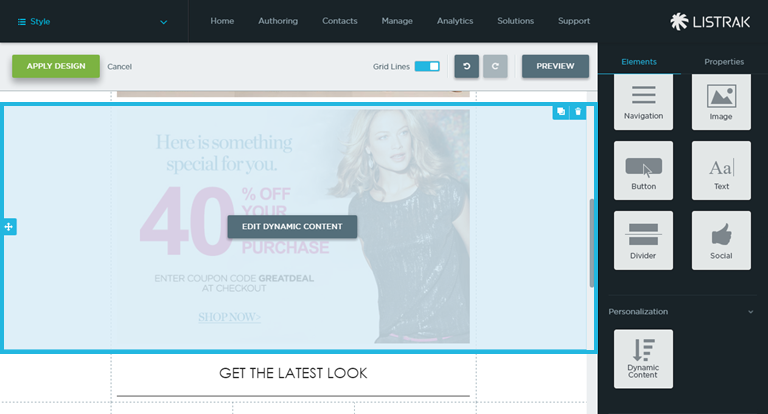 After the header and footer of your email is built, you can add dynamic content. 1. Drag and drop the dynamic content element onto the canvas. When the element is dropped, a larger container appears underneath your content with variations. This is where the dynamic content is built. 2. Click the container and enter a Name. For this example, ours is called Loyalty Status. Next, you can begin building your variations. These are the different areas of dynamic content that are placed in your email. NOTE: Up to 10 variations of dynamic content may be added. 3. Click New Variation to begin adding the containers for content. 4. Enter a Name for each variation. For this example, we'll name the variations recent customer, lapsed customer, non-customer. 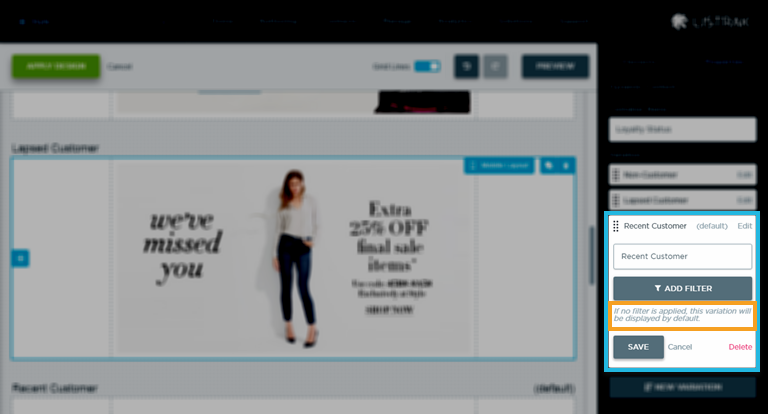 With the dynamic content, you can show an email with a higher offer in the content to someone who hasn't purchased before (or ever) to come back and buy again. After you have created and named your variation containers, you can begin building the variations. Adding content to the dynamic content structures is identical to the way you would build out your structures in Composer. Follow the below steps to begin building your content. 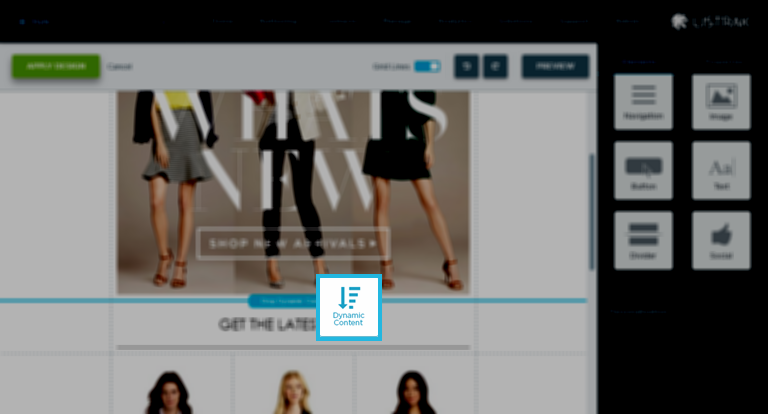 Drag and drop the image element onto the dynamic content canvas. Under the component properties, navigate to Image. Select your image from the Media Library. NOTE: With dynamic content in Composer, you no longer have to use the Content Library for your content. Simply place your content in the Media Library, where no HTML is needed, then select what content you want to display based on segmentation. It's important to understand how the filtering is applied on the variations and the priority that is given to each based on their hierarchical level. When you're placing your variations on the canvas, be sure to prioritize them from the top down. Filters are prioritized from the top down, which ensures a contact doesn't receive more than one variation in their container. Once a contact matches a filter, they won't receive any variations below that filter. If you want to create dynamic content that will deliver multiple variations to a contact, create multiple containers. Each container will have only one variation that includes a filter and no backup. A contact will either match that filter and receive the content, or not match the filter and receive nothing. This allows them to match the filter of several variations. 1. Click edit on the variation card. 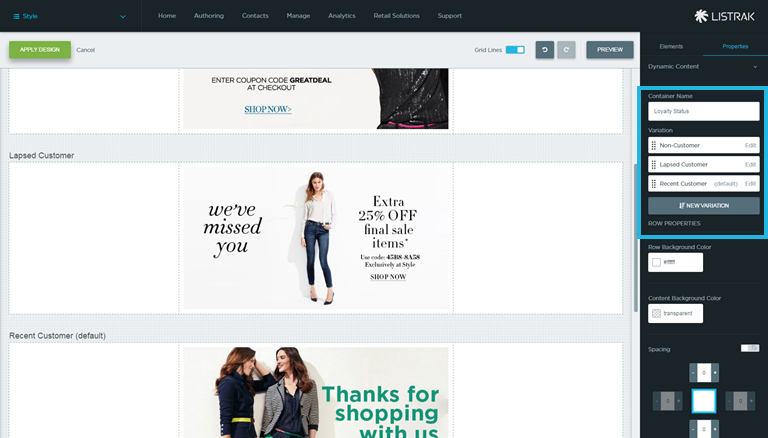 A pop-up launches where filtering is applied. We'll enter the below audiences, according to the variations to fit the above example. 5. Enter a Day Value for the customer to be considered recent. When the filter is applied to your variation, the box around the variation will turn red and No Filter Selected will no longer appear on the top right-hand side of the variation container. Repeat the above steps to apply filters to all variations. If your customers do not fit into any of the above audiences, segments, or preferences, by default, they will be shown the last variation. This is a good one size fits all section of content, so that your customers aren't receiving an empty or irrelevant email. With Composer, you are not required to set a default variation-- filters can be applied to all variations. After all of the variations have been customized, navigate to the top of the dynamic content canvas. Your message collapses the dynamic content container to display only the first variation. 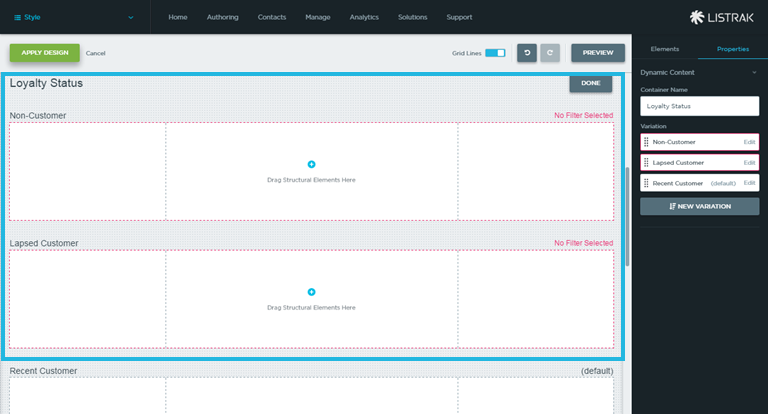 When collapsed, the options to drag and drop the container appear, along with duplicating or deleting a structure. When duplicating a dynamic content container, all of the variations and content are duplicated with it. Read more about the below example use cases in the Listrak Blog. Add up to 10 variations of dynamic content per container. 10 variations allows for a sleek, clean, and workable UI. You may add as many dynamic content containers as you want, however, if a contact matches more than one filter, they could be shown more than one variation. This is an example of top down filtering. If your dynamic content is mutually exclusive, you may add as many containers as you’d like. For example, if you want a person to ONLY select shoes OR shirts.